Sharp to release a 5.5" IGZO 4K mobile display! 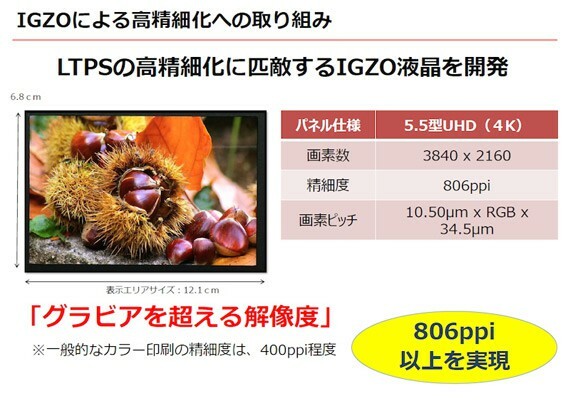 You are here: GeekSays Technology News » General » Sharp to release a 5.5″ IGZO 4K mobile display! Sharp to release a 5.5″ IGZO 4K mobile display! When the first smartphone with a 2K display was announced, everybody thought that at a resolution of 2560 x 1440, there are way too much pixels for such a small display, as the human eye is not even capable of distinguishing anymore. Well, the fact is that until 8K your eyes can tell the difference, so there’s still room for improvement. Japanese manufacturer Sharp, known for delivering some of the…well, sharpest panels on the market, is ready to take everything with one step forward. According to GSM Arena, they just announced the first 4K mobile display. The IGZO panel is using a RGB matrix and it has a resolution of 3840 x 2160, reaching an incredible density of 806 pixels per inch. Basically, with a 4K mobile display, you will be able to enjoy images as clear as the ones seen on a big-screen TV. Considering that just a in a few years we went from 720p screens, which were amazing when they were introduced, it won’t be long until we’re going to hold smartphones and tablets with 8K display, which will most likely be the final step. And speaking about 8K, LG is rumored to be making such panel for an upcoming iMac, so the wait shouldn’t be that long. Still, there are a few big questions: How powerful should a smartphone be in order to deal with so many pixels? What kind of battery does a 4K mobile display needs? For the moment, we’re going to play the waiting game and see what 2016 will bring!